Honestly, I get stuck in my ways when it comes to making weeknight meals. I often go for something that is incredible easy and takes 15 minutes or end up ordering in/picking up from the shop on my way home. 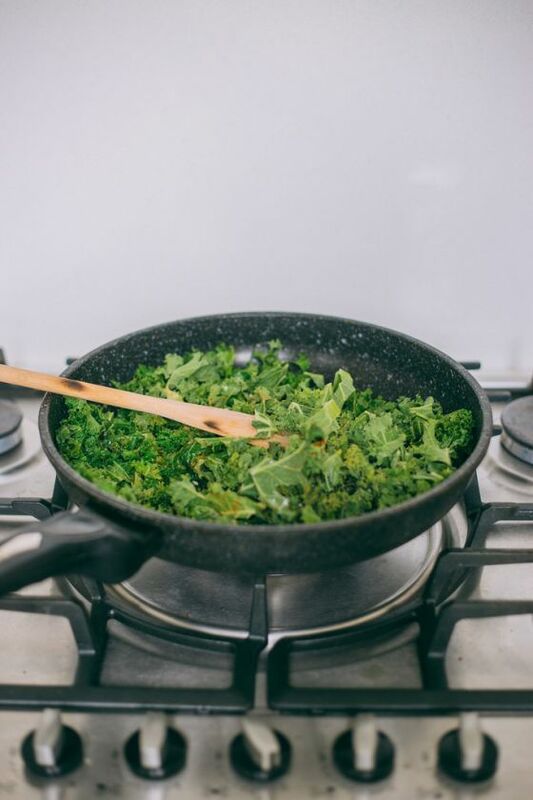 Then every single time I aim to make one of those fast dinners or pick up something from the store, I go for “comfort food” and end up deviating from my diet of keeping healthy and mostly plant-based. I thought it was something to do with being too exhausted and that didn’t seem to be the problem because I often stay up late working on blog things. So I looked into it just a bit more and it seemed that it wasn’t laziness, but it was purely that I miss comfort food. I always end up eating extremely healthy throughout the day and in the evening I crave for a bit of a cheat. If you know me, you’ll know that I have quite the appetite, but I knew I could curb that by being a bit more strict with what I was consuming in the evenings. Let me add in the fact that my body got rocked recently with the flu and an infection, which I think my lacking immune system needs to be blamed. 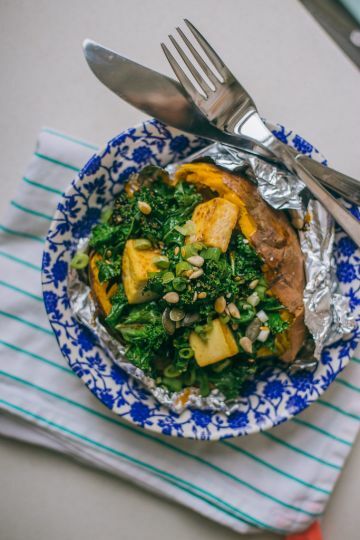 Since going plant-based, I haven’t been able to read up on protein and nutrient-packed vegetables, and found sweet potato recipes are a great way of incorporating lots of vitamins to balance a more vegetarian meal. So here’s to combining some of my favorite comfort foods with action packed nutrients! 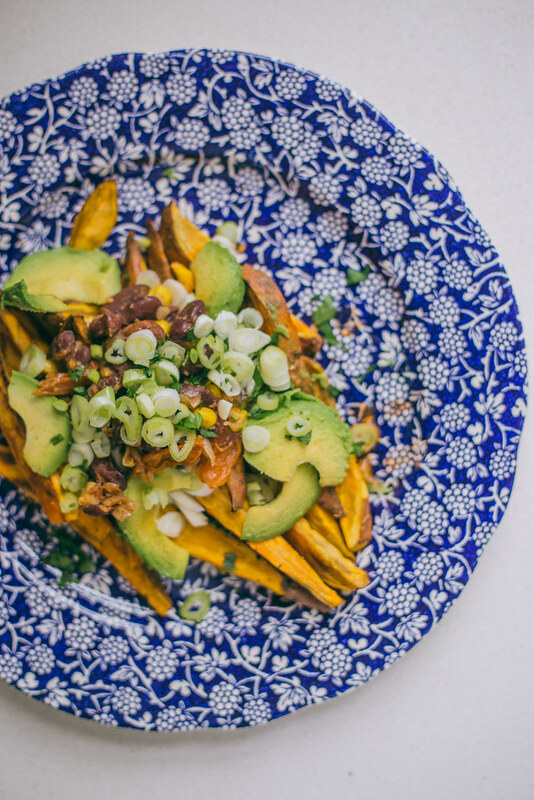 So, my two favorite sweet potato recipes to date! One of the things I’ve been doing is consuming a bit more tofu than my usual of once every six months. My mom, a former vegetarian, told me the when she first moved to America in the 80s, there wasn’t much available and so she had to hunt for vegetarian protein options. These were the days when vegetarian and veganism wasn’t much of a thing really. She discovered tofu and even created some of her own Indian inspired recipes from it, one of which I shared here! Tofoo is a brand I’ve loved. 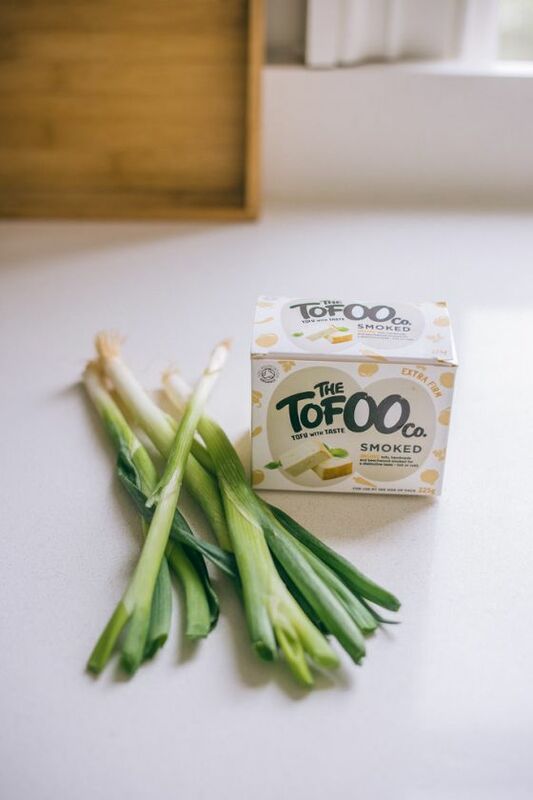 It’s organic tofu made with natural ingredients made in the traditional Japanese way in the UK—by hand. 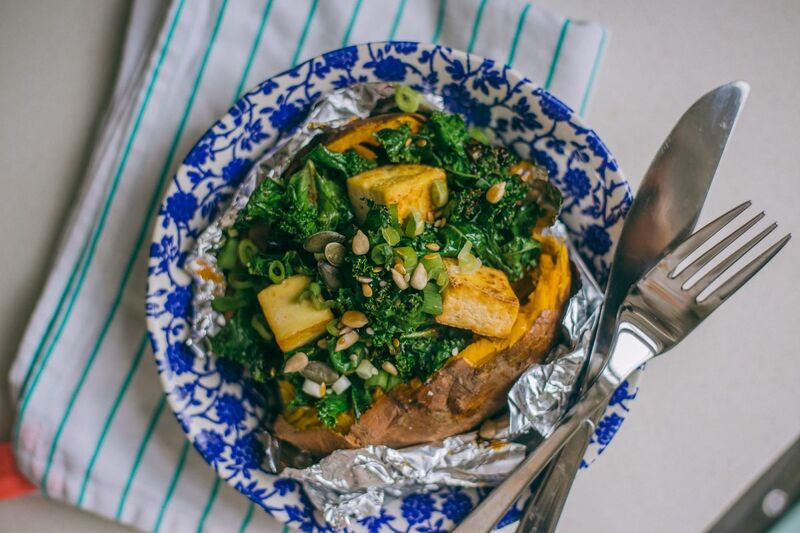 I’ve incorporated it into a loaded sweet potato recipes with some crispy kale and some seeds for the texture play against the soft sweet potato, that I usually crave when it comes to loaded potatoes. Preaheat the oven to 180ºC/350ºF. 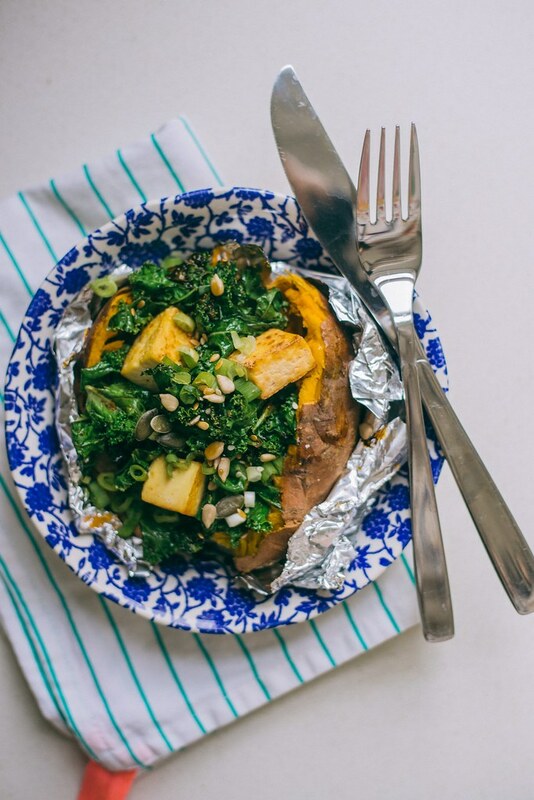 Cover each sweet potato with aluminum foil, make piercings in the sweet potato. Bake for about 20-25 minutes. In a large pan, add the ghee and pan-fry the tofu until golden on each side. 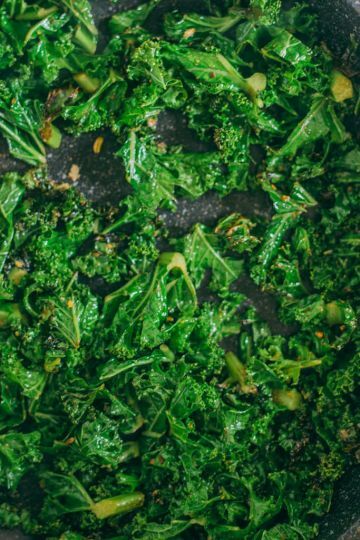 Set aside on a dish and add the kale, dried fennel, mexican seasoning and salt. Add a tablespoon of water to the pan to add some steam. Continue to pan-fry until crispy. To assemble. 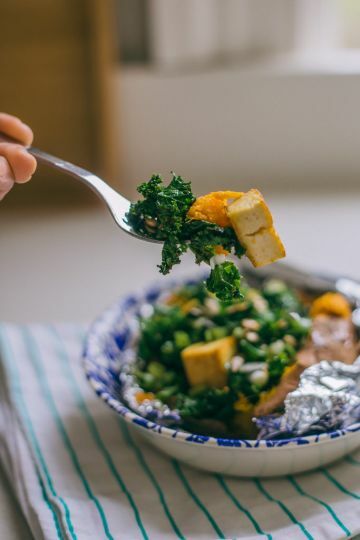 Slice open the sweet potato, add the kale and tofu. 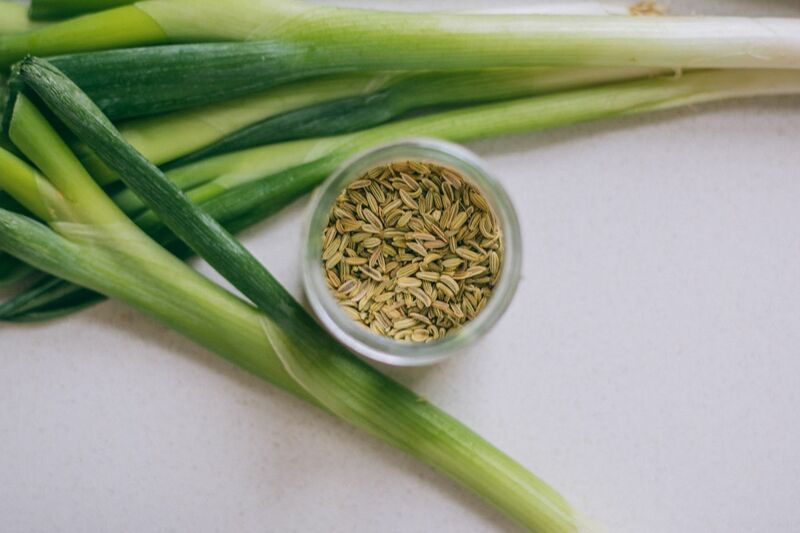 Top with sunflower seeds, pumpkin seeds, spring onions. 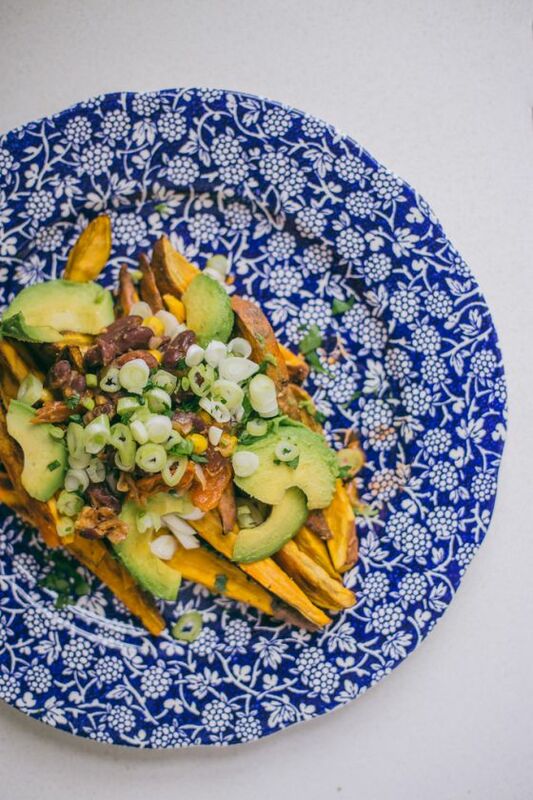 So tell me, do you have any favorite or go-to sweet potato recipes? I’ve been eyeing up Ghee Easy in Sainsbury’s. The truth is that I’ve grown up on ghee and every time I go to India I’m spoiled by how sweet and nuttiness the ghee is. If you’re unaware, ghee is clarified butter, or butter where the milk solids are removed. 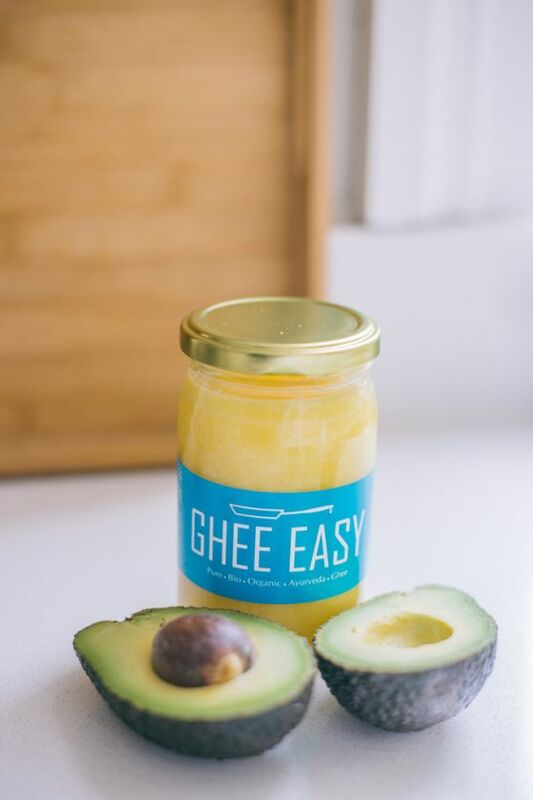 Ghee Easy, in particular, is made from Dutch organic butter. It has a high smoking point making it one of the best things to use to cook with. I’m not deviating from the truth when I say that this ghee tastes just as smooth as the ghee I have when I visit my mom’s village in India. I used ghee to cook up the beans and corn for my chili fries to give a touch of comfort. Cooked it on low heat for a bit, so it softened the skin of the kidney beans, making it that perfect mushy texture when biting into a crunchy sweet potato fry! 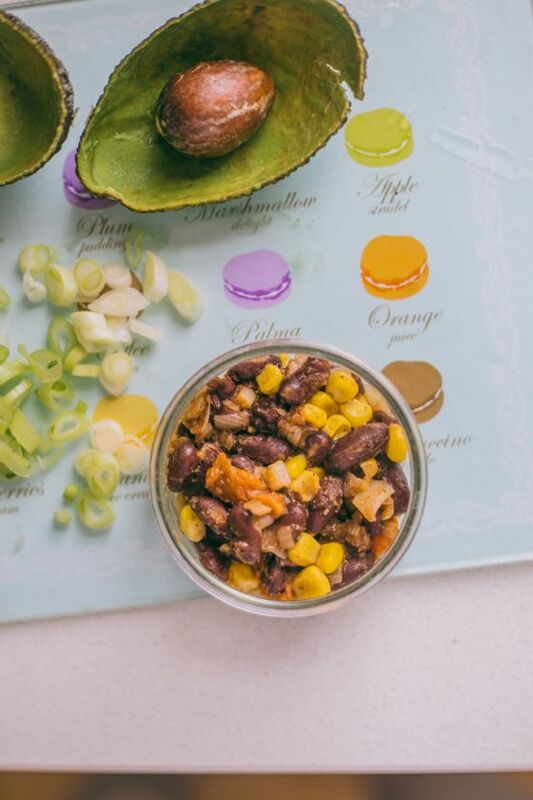 In a saucepan, kidney beans, sweetcorn, half the smoked paprika, all of the dried oregano, half the garlic powder and half ground cumin. Salt, stir, cover and simmer for about 20 minutes. Meanwhile, preheat the oven to 230C/450F. Cut the sweet potatoes into strips. In a large bowl, combine melted ghee, and rest of the dried ingredients. 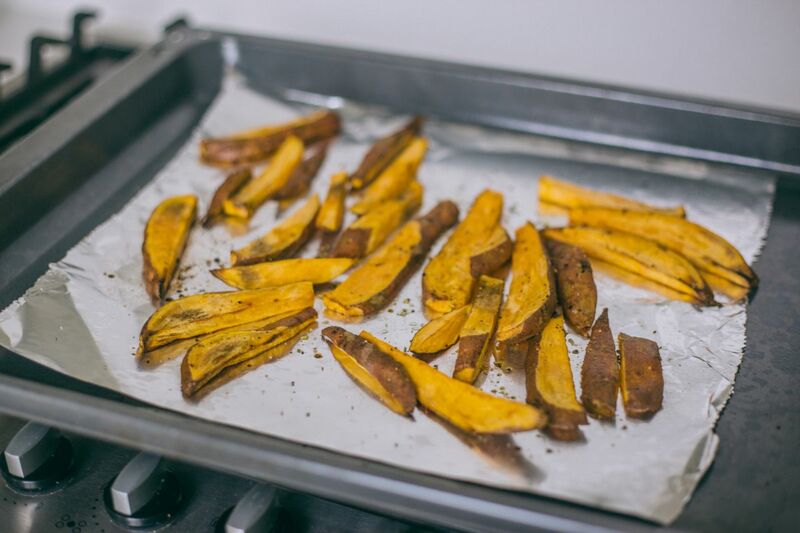 Mix so all the sweet potato strips are well coated then arrange on a prepared oven tray. Place them on the tray so each wedge is not too close to another, then bake for 25-30 minutes. Once they’re baked, remove from the oven and top with salt. Let them sit for about 5-7 minutes. 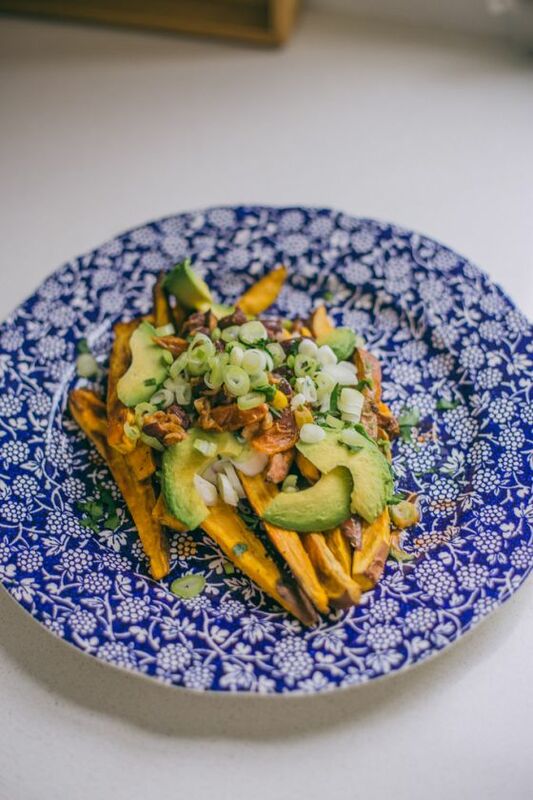 To assmble: place some of the bean mixture on top of hte fries, then greek yoghurt and top up with the sauce from the bean mixture, spring onions and avocado slices.